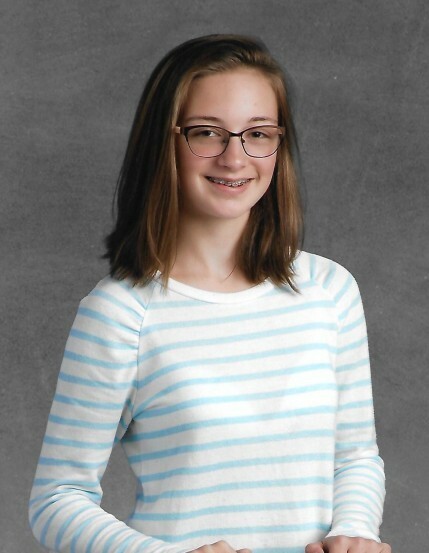 Gracie Madeline Awalt, 14, of Morehead City, passed away unexpectedly on Wednesday, August 15, 2018 at New Hanover Regional Medical Center in Wilmington, NC. Gracie graduated from Morehead Middle School and was about to start her Freshman year at West Carteret High School. She was a member of the Girl Scouts, ran track and field and was a member of the WCHS Marching Patriots Band. A memorial service will be held 11:00 AM Saturday at Open Door Baptist Church in Morehead City, with Pastor Jerry Linebarger officiating. The family will receive friends from 10:00 to 11:00 prior to the service on Saturday. She was loved and will be greatly missed by her parents, Nathan and Lindsey Awalt of Morehead City; sister, Kaylie Awalt of Morehead City; paternal grandmother step-grandfather, Linda and Robert Shuman of Tuscarawas, OH; paternal grandfather and step-grandmother, Keith and Karen Awalt of Louisville, OH; maternal grandfather, Bruce Campbell of Los Angeles, CA; several aunts; uncles; and cousins. Gracie was preceded in death by her maternal grandmother, Roxanne Russell, and maternal great-grandparents, Gary and Marjorie Harper of Navarre, OH.